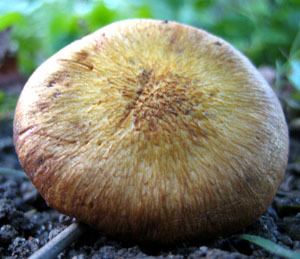 Yellow-brown, dry, scaly cap with white to discolored gills and stalk. In clusters. Cap: 2.5-10 cm (1-4") wide. Convex to flat or sunken, margins uplift with age. 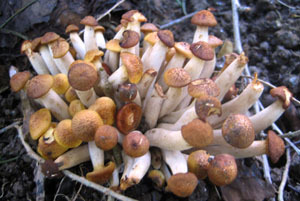 Dry yellow-brown with flat to erect scales. 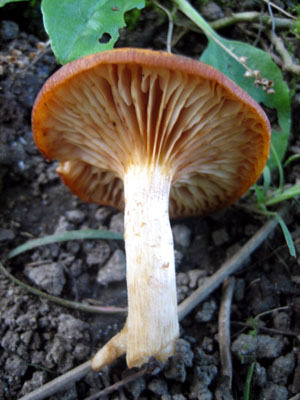 Gills: Somewhat descending stalk, nearly distant, narrow to broad. Whitish staining pink to brown. Stalk: 7.5-20 cm (3-8") long and 0.5-1.5 cm (1/4-5/8") thick. Tapering toward base. Fibrousm off-white to brownish. Stuffed to hollow. In large clusters at bases of trees of over buried wood, especially oak. North East North America to Florida, west to Kansas and Texas.